High tech aiming, ordinance, etc. Soontir Van by Arch-vile has passed United Fanscape Review and moves forward in the process. 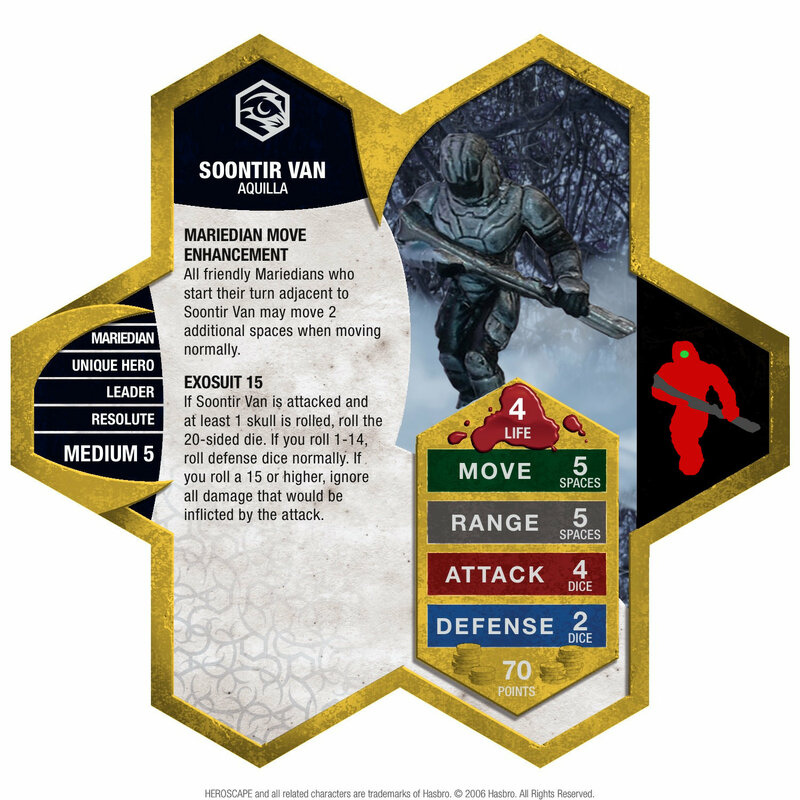 There has been a change to the Soontir Van submission. The miniature used was a troublesome point for a number of Inner Sanctum members, as it was here publicly as well. The pistol-holding miniature has been replaced with a rifle-wielding one with the same armor, the Sith Trooper from the Star Wars Champions of the Force set. @Arch-vile , could you update your original post with the new card and miniature information? It would be helpful to leave the old information there as well. The original submission post has been updated. I'm excited to see what the judges think of him! Just so I'm clear, a pistol having 4 Attack is not OK, but a rifle only having 5 Range is? It is kind of funny. There are rare occasions that work for this. I've seen some guys down at my gun range that can hit targets better with pistols out at 50 yards where some guys can't hit the same targets with a rifle. But its rare. Having a short range with a rifle seems like it reflects poorly on the guys skill level. Unless the said rifle is a shotgun with a short barrel, No choke, and he's shooting buck shot. But he doesn't have a shotgun attack either. It's not real, its a game, but the theme doesn't come through as well. In short, I agree with NB. There are real life handguns out there that should reasonably roll 5 dice, not just 4, and a futuristic space handgun should have no problems rolling 4. Especially when Kaemon Awa is rolling 4 with a compound bow. But that's just my opinion. I think it's a slight improvement, but I would have been ok either way. There's lots of weird variance in weapon ranges in Heroscape. Why should the Stingers have 5, with their fancy beam weapons, and the Krav, whose defining feature (judging by the power set and the minis) is stealthiness and not marksmanship, have 7? It makes no sense. I don't give it much thought. It is kind of funny. A typical figure is maybe 6 feet tall and when you lie them down they cross one hex. That means that a range of 5 is about 30 feet, 7 range is 42 feet and 10 is 60 feet. In this case everyone is bad with firearms. I can't be sure, but It seems your familiarity with firearms informs the concern with weapon type. I've never fired or even held a gun, so to me there is no preconceived notions of what a rifle vs a pistol should do in game. I have zero interest in guns (I'm not American ), but my layman's perception would incline me to think that rifles are generally more powerful, longer ranged and more accurate, but a lot less portable than stealthy. Most things can be explained away with the character's skill level, though. There are a lot of things in this game that don't make sense if you try to make them correlate to reality. When it comes to this, I look at precedent. I can't think of a figure in the game with a sidearm that size that gets an attack of 4. That's not to say that there should never be a figure with a sidearm and an attack of 4, but I see nothing about that figure to justify the attack of 4. Side note: I've seen people bumping attacks up to 3 from 2, and to 4 from 3 in order to make figures more effective. I would encourage designers to be cautious about doing this: practice restraint. The official canon does give us a lot of variance in attack *ranges*, but in the attack value itself, the number is often low. In fact, the chief reason I think this new mini is (slightly) preferable is that the bigger weapon is a better fit with Attack 4. There must be something in the water down by the Durgeth Swamps cause Uzog is one big boy. He is set to join the other swamp dwellers, while looking for skulls to add to his collection. Is the big lug too big for his breeches or is he suited to start collecting the skulls of Kyrie, Soulborgs and Dragons? Balance – As always when considering the balance of a unit, I consider attack output and survivability. With 5 base attack and the potential for his opponents to roll 2 less defense after Uzog adds some swag to his outfit, he is can take on the stoutest of heroes. As for survivability, 6 lives are a fairly deep life pool even with 3 defense as can be seen with the Venoc Warlord or Marcus. While Uzog outclasses both warlords on attack, their cheerleading abilities are better than Uzog’s boost to the Durgeth. On his own I found Uzog to be a fine beat stick to add to the collection among the likes of solo Alistair, Brunak or Siege. Speaking of Durgeth, I would be remiss not to compare Uzog to his bonding rival Pel. In my experience Pel is a better choice when playing against less experienced players, whereas Uzog just feels right with the Ravagers mimicking the aforementioned Warlords and their respective bonding squads. While I feel that the squad should cover the cost of the bonding power, it is important to not completely outshine other options, especially since the conditional nature of the Ravagers bonding means they may only need to be paired with one hero throughout a game. In this regard Uzog’s points benefit him well since any lower and Pel would be far to outclassed. Creativity – While it may appear otherwise, Uzog has essentially one power that has been split into two for simplicity. I value this restraint, especially when a unit is potentially part of a bonding pair since too many powers can spoil the broth. I like that the miniature is a monstrous version of the Ravagers, as it gives him some identity while furthering the theme. The inspiration to make the Skull markers also benefit the Ravagers, ties the hero to the squad well, without being overpowered, since the Ravagers are already throwing a fair number of dice. Theme – I’m not sure if the miniature or the special powers came first in the design process, but they work well together to create a theme of a big dumb oaf who likes to collect skulls. Trophy hunting monsters is a classic trope, and well represented here. I especially appreciated the stat box, for the restraint in going with 3 defense over 4 and slower move, since they further the hulking lout theme. Allowing the player to select when to collect a skull does give more agency than I think the design implies, but that is a small personal quibble. Playability – Though Uzog was clearly designed with the Ravagers in mind, I still like to look at bonding heroes when running them solo. In this regard Uzog struggles but is not entirely useless. Obviously, you wouldn’t want to save Uzog for clean up duty since missing a turn to pick up skulls can be game ending when you only have a figure or two remaining. On the other hand, there are so many better options to lead with, that it seems foolish to send him out first and sacrifice board control. I liked running him out during a second wave after scouts have fallen, and squads are spread out. In these instances, you can spread out your Order Markers a bit so Uzog never has to miss a turn to pick up a skull, and his high attack can be used effectively on other bruisers roaming during the midgame. There are definitely better options for 110 points during the midgame, but that’s true of most units. As a solo hero he can mostly carry his weight and its always fun to tell your opponent you are ripping the head off one of their figures as a trophy. While serviceable, Uzog is best when he is heading the Ravagers Savage Cry. As previously mentioned I found that Uzog felt like he belonged with the Ravagers in a way the Zombie Hulk or Pel cannot match. Since you cannot be certain if the Savage Cry will trigger, you almost always want to grab a skull when you can. Once Uzog is in the fry he makes the Ravagers that much more formattable, even without an activation. As mentioned 6 lives and 3 defense won’t protect him forever, but he can hold up reasonably well against unfocused fire. Like most bonding heroes Uzog presents an opponent decision to attack the hero or the Squad. I found this decision to be slightly exasperated since the Ravagers are dangerous on their own and Uzog may no activate at all, but Uzog has nowhere to hide and can easily handle other heroes when sporting a couple skulls. I also liked this duo since it encouraged some Order Marker management where Uzog received a few Order Markers even when there were Ravagers still in play (something you would never see in a traditional bonding squad). I enjoyed playing Uzog with his brethren especially in one game where I repeatedly reminded my opponent that Uzog had taken the head of Q9. Summary – To me Heroscape games are as much about the story that unfolds as they are about winning and loosing. While Uzog may not win as many games as more competitive figures, few special powers (Hivelord Life Bonding notwithstanding) leave an impression as much as Trophy Skulls. Simply put, Uzog feels like a natural addition to the Durgeth Swamp.